I started this article with every intention of going through Michelle Obama’s entire speech at the DNC convention. That didn’t work out as planned. I got about a quarter of the way through her speech before I just could not bear even to look at the text of it anymore. It is beyond absurd. I will go through the rest of it at a later date, if my scheduling allows. But even just this first portion is incredible!!! WE KNOW! You’ve travelled all over this country and several other countries… ALL ON OUR DIME. She goes on from here to talk about wounded warriors and heroes that make sacrifices for other people, often risking their lives. I would have no quarrel with that part of it, except that it is obvious empty rhetoric and pandering to a group that does not support this president because they know full well how much (or little) he has supported them. Wait… Serving..? How exactly is she serving us? By telling us what we should feed our children? By vacationing and partying at the taxpayer’s expense? And yes, Michelle, we are all fully aware that you had some “concerns” about the “journey we’d begun”. We know that you first became proud of America only after your husband was elected. We have doubts about just how proud you are of America, even today. One should EXPECT laughter after hearing this joke! Hell, I don’t even know where to begin! Obviously Michelle learned something about writing an auto-biography from her husband. Her narrative here is just as fake as anything that Barack wrote (assuming he actually wrote it) in Dreams of My Father. Where are the fact checkers now? Michelle Obama was NOT a soccer mom!!! Not even REMOTELY a soccer mom! But here she claims to have been pulled from that care-free life to serve as First Lady..? This is the type of lying that liberals are known for, and the media will allow it to pass unchecked because they support the liberal agenda. This should read “incredulous laughter”. Does anyone believe that Senator Barack Obama was driving around in a car that was rusted out? Anyone..? Liberals, do you really buy this crap? There are two types of liberals; those that believe the lies, and those that happily repeat them, knowing they are lies. Senator Barack Obama was a dumpster diver?! Michelle Obama just called the president a dumpster diver at the DNC convention, and not a single liberal media outlet even so much as cocked their head in wonder. On the contrary, they APPLAUDED! This is like an episode of the Twilight Zone, folks! The rabbit hole goes deeper from here. Too deep for me to get into tonight, but in preview, I will say that Michelle claims that their lofty Ivy League educations were paid for with student loans, and further claims that they had to work very hard to pay them off. Barack Obama went to Occidental, Columbia, and Harvard on Pell Grants and Stafford Loans..? I would love to see some proof of that! And I would love to see even one alphabet network fact check her speech. 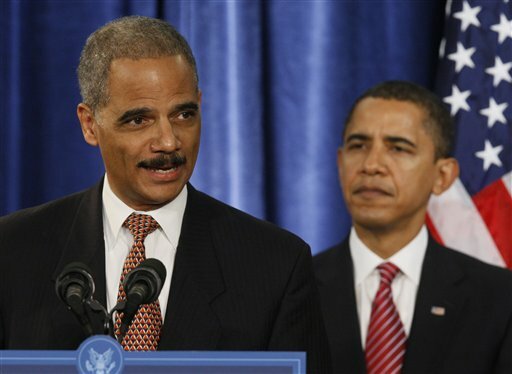 A Friday story in the Daily Caller by Neil Munro brings home to me several points; not just about liberal ideology, but about Barack Obama and Eric Holder’s race-based agenda. Seems that our illustrious president and his attorney general believe that black children get into too much trouble in school. That being so, they have decided that the problem isn’t that black children are more likely to act out or break the rules, but that the rules themselves are being unfairly applied. Nevermind that they have zero evidence to back up that assumption. It should be patently obvious to any good liberal that if black children are getting into trouble in school more often than children of other races, it must be because those charged with disciplining them are racist. Now, I have long held the opinion that school discipline policies border on the edges of insanity. Most schools have been stuck in their “zero-tolerance” mindset for so long that we see idiotic things happening, like students getting suspended for taking aspirin. But it is far worse than that. Schools often opt to suspend and expel students at far too high a rate for my tastes. I believe these forms of punishment to be extremely counter-productive, not just for the student and the school, but for society at large, and that they should be used as the very last resort. We do have a lot of real problems. Far be it for me to point out that the vast majority of these children are trapped in inner-city schools, and that the liberals are their captors. The teachers unions have a stranglehold on city schools even stronger than the hold they have in the suburbs. They have fought against conservative attempts to allow children to leave failing schools at every turn, and yet can not fathom why the children aren’t doing so well. “This is, quite simply, unacceptable. … These unnecessary and destructive policies must be changed,” he said in his speech, given in Atlanta, Ga. I find myself in complete agreement with Eric Holder on one thing. Suspensions and expulsions are indeed destructive, even when ultimately necessary. But the notion that blacks are somehow being unfairly targeted is ludicrous. Their solution to the problem is even more destructive, and it leads one to wonder if it may actually be intended to be destructive. After all, the more people who are dependent upon the government, the more people the government can control, and liberals actually believe that is a GOOD thing. The president’s panel is set to force several school districts to hand out punishments in line with the racial makeup of the population, regardless of the racial makeup of those breaking the rules. This means that white and asian students, who operate within the rules more often, are likely to be punished more harshly when compared to black students for the same offenses. That, my friends, is Obama and Holder’s idea of “equality”.